The International Institute for Peace, already since many years, is cooperating with the Center for International and European Studies of the Kadir Has University in Istanbul on its annualy International Neighbourhood Symposium. This year it took place in Odessa / Ukraine because Istanbul unfortunately became rather unattractive due to its internal political situation since the coup d'etat in 2016 and because of the rise of terrorist activities and attacks. Another reason, however, was also to foster cooperation with other organisations in the region, this time with Ukraine Analytika and Ukrainian Prism, two organisations dealing with Ukranian Foreign Policy. The topic of the this years symposium was "Changemakers in the Eastern Neighbourhood" and many of these potential changemakers have been participating in the 4 days symposium. There have been 38 participants from 14 countries with a small emphasis on Ukrainian and Turkish participants. Topics ranged from the global security context, to developments and crises in the Neighbourhood, the Mediterranean and the Middle East, from politics versus populism to civic engagement, cultural engagement and media in a post-truth age. The last one and a half day were peer- 2- peer workshops where groups had to work out a project, which could (and maybe even will) lead to a positive change in societal development. Ideas ranged from the necessity to build a platform for civil society organisations in the eastern neighbourhood to deal with specific topics concerning refugees in order to foster cooperation and to learn from each other to societal advertisement videos which should help to build empathy and solidarity in the region to educational programs dealing with conflict resolution. The director of the IIP, Stephanie Fenkart, was facilitating some of the workshops whereas Hannes Swoboda held a lecture on the view from Odessa at the EU's neighbourhood. 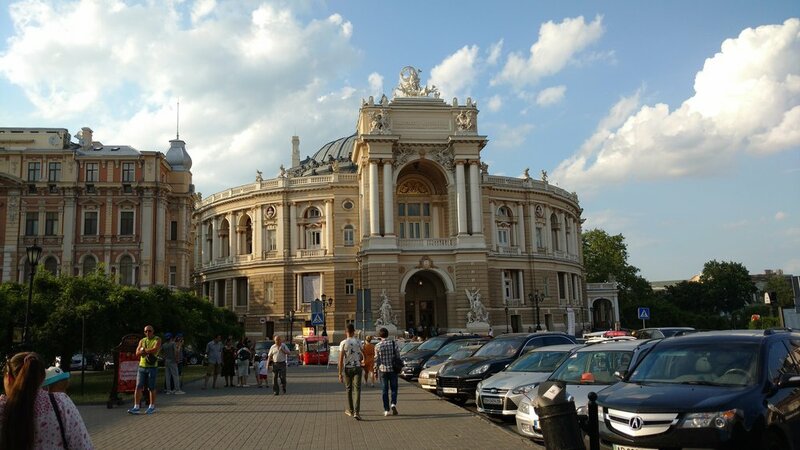 My first visit to the wonderful city of Odessa dates back to the early nineties when I visited the city as capital of one of the active Danube regions. The communists were dominating the country which was still part of the Soviet Union. A second time I came to Odessa when it had already become a Ukrainian city. After my visit now it became clear: Odessa is part of Ukraine with many Russian speaking - but clearly Ukrainian - citizens. It became a very lively city with many young people strolling around and spending time in the many street cafes. The street life of today is quite different to the quietness during the Soviet times. Odessa has a great but also horrific history. It was founded by Catherina II after occupying the region for Russia. It became a famous port city with close links to Istanbul. (Only recently an Istanbul Park was opened by the mayor of Istanbul at a very prominent place of the city.) Because of its port Odessa became a multicultural and diverse city. Many Jews, Greeks and numerous other people of different ethnicities settled there and participated predominantly in trading activities. Several foreign politicians, military men and architects played a key role in defining the city as multicultural. However, the city was a setting for numerous violent conflicts and wars. Especially the Jewish population became the victim of these conflicts. The worst massacre happened during the Nazi/Rumanian occupation before the end of World War II with an estimated murder of 30 000 jews. The old diversity could never be re-established but the pogroms of the past seem to be banned for ever. During the turmoil after the Maidan revolution and the Russian intervention in the Eastern Ukraine there was a danger of the conflict spreading to Odessa but one dreadful incident with many people killed convinced the vast majority to strive for peace instead of war. 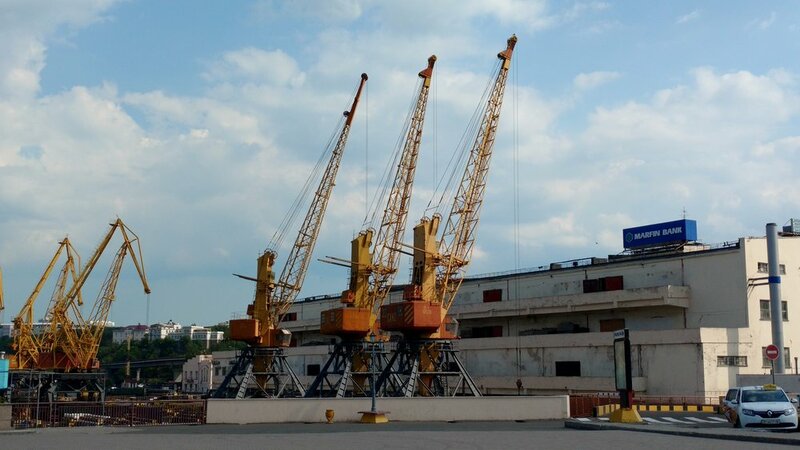 So today one can enjoy the city and its partly renovated buildings as well as the famous Potemkin-Stairs, which played an important role in the famous still-film "Warship Potemkin" by Sergej Eisenstein. The reason for me to come to Odessa was the invitation to support and participate in a yearly event organized by Prof. Dimitrios Triantaphyllou of the Kadir Has University in Istanbul. Normally the event takes place in or near Istanbul. This year there were some reasons to organize the "International Neighborhood Symposium" in Odessa - mainly because of the concerning atmosphere in Turkey and the lack of interest of the participants due to fear of terrorist attacks. The director of the IIP, Stephanie Fenkart and myself went to Odessa with the daily flight by Austrian Airlines from Vienna. We had interesting discussions with many active students from EU’s neighborhood countries which were eager to find ways of influencing the course of their respective countries. I myself spoke in a panel about "The Eastern Neighborhood in Upheaval". Crisis, upheaval or new normality? Looking at the situation in the EU's neighborhood one can come to different conclusions. Odessa and all our neighbors had many crises and have even been responsible for pogroms in the past. Odessa is not far away from the crisis region in Eastern Ukraine, from Transnistria and the two separate regions Abchasia and South Ossetia. aAcross the Black Sea you can find Istanbul also a city on the Black Sea, long term partner and opponent of Odessa. Nowadays also Istanbul is in a critical situation due to the Turkish president’s turn towards establishing an authoritarian political system. Nevertheless, we should not too quickly speak about upheaved and crisis or at least say that such situations are at least as normal as periods with strong stability, which we already had in this region. We often forgot in the past, that our - EU's - neighborhood is also that of Russia. Of course, it was self-evident for the EU and its major political forces, that the EU is by far the stronger magnet because of all the bad experiences with and within the Soviet Union. But due to failures and mistakes of EU neighborhood policies and the resistance of many political classes in these countries to do the necessary reforms, in some countries people began to give attention to Russian official voices which pleaded for closer links with Moscow. Very often the EU saw itself as an alternative to Moscow and Russia had a similar view from an opposite perspective. For the EU its "values" and standards seemed to be unequivocally convincing. Russia only began after some years of weakness and disorientation to underline their - traditional - concept of influence-zones built on government cooperation. In this respect they founded - with formal initiative taken by Kazakhstan - the Eurasian Union. Now we have two integration models in Europe - with two different modes. The EU is built on intergovernmental cooperation but with strong elements of community legislation and majority decisions. The Eurasian Union is neatly totally built on intergovernmental cooperation with the principle of unanimity. It will be necessary, but not easy, to design ways of cooperation between the two integration organizations. But we have to recognize, that some countries inside the EU look rather sceptically or outright negatively at a possible cooperation with Russia, which is perceived as neo-imperialist. The review of the EU's neighborhood policy shed a strong light on the problems of a policy which was designed according to the principle "one fits all". The talks with Ukraine but also with Armenia and Azerbaijan and also with the different countries in the Maghreb and Mashrek region demonstrated the necessity for individual, tailor made solutions. This was an enormous progress and politicized in a positive sense the neighborhood policy with a wide spectrum of instruments. Nevertheless, not everything is satisfying. In the interest of the citizens of our neighboring countries we should be stricter in monitoring the implementation of our policies and aims. Too often we are afraid that our conditionality is pushing our neighbors into the hand of Russia. But the case of Moldova showed that if the EU is too tolerant with ongoing corruption and the non-implementation of promised reforms, the population becomes very critical of their government/political class and the EU alike. It is not easy to draw a line between accepting the difficulties of reform processes and the toleration of non-compliance. But the closer the countries come to the EU and its principles the more we must expect from them the implementation of reforms. But, of course, the EU should always respect the interests of the citizens for improvements in their economic and social situations. Not always are radical reforms - according to the neo-liberal orthodoxy- the best way to a new welfare economy. However, without a rising living standards for all the EU will not be able to convince the citizens that the way toward Europe is the best choice. A much more sophisticated reform strategy would be the best method against populist and foreign interventions which are opposing the strong trade, culture and democracy links to the EU. The monitoring of the implementation of necessary reforms like an efficient strategy against corruption and oligarchisation can never be done by the EU and its instruments alone. The monitoring is an ongoing process which must also (!) be approached from within. Parliament and other public authorities must do that job. Still, often this is not enough or not really done at all. So, we should invite and support civil society to come into the game and take over this task or at least add its monitoring to the official institutions. Civil society is much more independent and certainly more critically than official institutions. But they must also be realistic and sometimes even pragmatic to be heard. That is not in contradiction to be frank and consistent. In addition, they must be embedded into the wider society and respect the basic economic and social interests and aspirations of the population. Only then will the government listen to them, because disregarding them would be disregarding many voters. In many neighboring countries we see a rise in populism. But that goes parallel to similar developments inside the EU. The reasons for rising populism are manifold. The lack of economic progress, social inequality with the perception of unfair treatment often leads to the search for quick and easy answers and new strong leaders. The confrontation with current issues as well as migrants and refugees coming from other cultures is an additional factor. If all these challenges are misused to offer "the" solution - often by designing scapegoats like refugees and immigrants - we can speak of populism. In many cases populism is transposed into an authoritarian rule which makes changes in government majorities difficult, sometimes nearly impossible. The development goes from democracy to illiberal democracy to de facto dictatorship with a strong security apparatus. However, civil society should be supported by the EU - officially and unofficially as well as directly and indirectly - to preserve a minimum of democratic life and democratic freedoms. Even if some governments will try to cut and prevent financial support from outside sources, the EU and many foundations should find ways to support civil society. That is not equal to supporting regime change, but means empowering citizens to express their aspirations and democratic rights. The EU cannot and must not impose its rules and laws on other countries, but the EU has the right and even obligation to help citizens in achieving respect for their basic human rights – which are shared universally. The EU had to learn and recognize that the enlargement process and the neighborhood strategy is no longer alone decided by the EU itself. Russia is not as attractive as the EU, but it plays a role of at least disturbing the rapprochement of EU's neighborhood to the EU. There is no way out of that dilemma but adapting the neighborhood policy to the individual situation in the different countries including their relationship to Russia. At the end, it is the people who decide which way to go,how and especially, how quickly. The EU must reconsider its demands in respect of reforms and concentrate its demands more on the citizens and their aspirations. Economic and social issues must be added to the modernization of democracy and the fight against corruption. The monitoring of a comprehensive reform package must be taken more seriously and must be shared with the civil society. They should be empowered on a large scale to bring speed and especially thoroughness and transparency to the reform process.